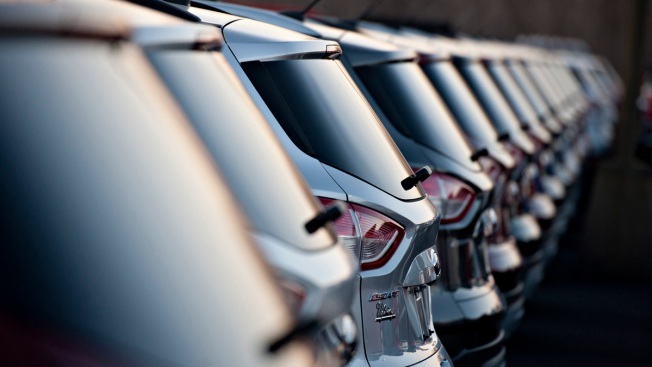 In this file photo, a row of 2014 Ford Motor Co. Escape vehicles sit on display at Uftring Ford in East Peoria, Illinois, U.S., on Saturday, Nov. 30, 2013. Misrepresentations in advertising or sales of new and used cars topped the list of fastest-growing complaints to state and local consumer protection agencies in 2015. Phony IRS agents and other imposter scams topped the list of fastest-growing complaints to state and local consumer protection agencies last year, according to the latest report from the annual survey conducted by Consumer Federation of America and the North American Consumer Protection Investigators. Thirty-three consumer agencies from 21 states participated in the survey, which asked about the most common complaints they received in 2015, the fastest-growing complaints, the worst complaints, new kinds of consumer problems, agencies’ biggest achievements and challenges, and new laws that are needed to better protect consumers. Scams of all types were cited as among the worst complaints reported to state and local consumer protection agencies last year. Another new problem that agencies mentioned is the use of iTunes gift cards as a method of payment. Once the scammers get the codes on the gift cards from the victims, they can use those cards to make purchases or sell them on gift-card resale websites. The top complaints of 2015 were those most frequently cited by the agencies as the most common complaints they received last year. 10. (Tie) Internet Sales. Misrepresentations or other deceptive practices, failure to deliver online purchases; Fraud. Bogus sweepstakes and lotteries, work-at-home schemes, grant offers, fake check scams, imposter scams and other common frauds. The top suggestion for new laws needed to better protect consumers was to ban forced arbitration clauses in consumer contracts. These clauses prevent consumers from taking legal action to enforce their rights and change company behavior. Other suggestions included free credit freezes for consumers on demand, stricter laws against Caller ID spoofing and robocalls, used car lemon laws, and stronger curbs on abusive debt collection.